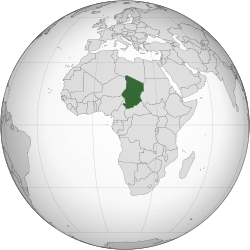 Chad (French: Tchad; Arabic: تشاد‎, officially called the Republic of Chad), is a landlocked country in Central Africa. The capital is N'Djamena. It was a French colony until 1960. It suffers from poverty, illness, drought, and armed conflicts. In 2011, the population of Chad was 11,525,000. Chad is the world's 21st-largest country. It is slightly smaller than Peru and slightly larger than South Africa. To the north is Libya, to the south is the Central African Republic, to the east is Sudan, and to the west are Cameroon, Nigeria, and Niger. The country's capital is 1,060 kilometres (660 mi) from the nearest seaport Douala, Cameroon. Due to this distance from the sea and the country's largely desert climate, Chad is sometimes called the "Dead Heart of Africa". Lake Chad is the largest wetland in Chad and the second largest in Africa. Lake Chad was 330,000 square kilometres (130,000 sq mi) 7000 years ago. Now it is 17,806 square kilometres (6,875 sq mi). Chad's highest peak is the Emi Koussi in the Sahara. The region's tall grasses and large amount of marshes make it good for birds, reptiles, and large mammals. Chad's major rivers are the Chari and Logone. Since February 2008, Chad is divided into 22 regions. Before it was divided into 14 prefectures. Chad's official languages are Arabic and French, but over 100 languages and dialects are spoken. Due to the important role of Arab traders and merchants, Chadian Arabic has become a lingua franca, a language for all to use. Attending primary school is required in Chad, though only about 50% of children attend school. Adult literacy is only 35%. The University of N'Djamena provides higher education. ↑ "President Idriss Déby of Chad, in Power Since 1990, Wins 5th Term". New York Times. 21 April 2016. Retrieved 10 December 2016. ↑ 2.0 2.1 Central Intelligence Agency (2009). "Chad". The World Factbook. Retrieved January 28, 2010. ↑ 3.0 3.1 3.2 3.3 "Chad". International Monetary Fund. Retrieved 2011-04-21. ↑ Collins School World Atlas (Third ed.). Collins. 2013. p. 90. ISBN 978-0-00-748441-6. ↑ "Chad", The World Factbook. ↑ "Rank Order – Area"
↑ "Chad". United Nations Commission on Human Rights. ↑ D. Botha, "S.H. Frankel"
↑ 10.0 10.1 "Statistics Chad". UNICEF. 24 December 2013. Retrieved 10 December 2016. This page was last changed on 12 March 2019, at 20:21.